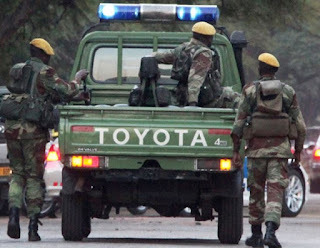 The Zimbabwe National Army has dismissed claims by some online publications that it deployed soldiers who were causing terror in Nkayi. In a statement on Monday, Director Army Public Relations Lieutenant Colonel Alphios Makotore said the claims were false. “Reference is hereby made to a story ‘Soldiers causing terror, havoc in Nkayi’ which was published in an online edition on 23 January 2018. “In the story, it is stated that Zimbabwe National Army members have been accused of abusing villagers in Gwelutshena area, Nkayi, ahead of this year’s elections,” he said. “The ZNA would like to state that no members of the army are deployed in the Nkayi area or any of its surroundings. None of its members are therefore involved in the aforementioned activities,” he said. Lt Col Makotore said the ZNA does not engage in Zanu-PF politics. “Furthermore, the organisation is not involved in any Zanu-PF political campaigns as suggested by the article,” he said. Lieutenant Colonel Makotore said the media must contact the ZNA to verify facts before their publication.